Ready to be the envy of all the other guys at work, and still have skin left on your knuckles? Say you find yourself trying to drive a screw that is too close to a wall or other obstruction; what do you do? Normally you would try to drive the screw with your screwdriver at an angle, and lose a bit of skin against the wall in the process. This sometimes gets the job done, but often ends up stripping the head of the screw at the same time. A right angle driver might be a solution to this problem, but it will still leave the driver tip a good distance away from the wall. I believe the correct answer would be to use a flexible shaft, like the 392 Flexible Shaft bit holding screwdriver from Wera. 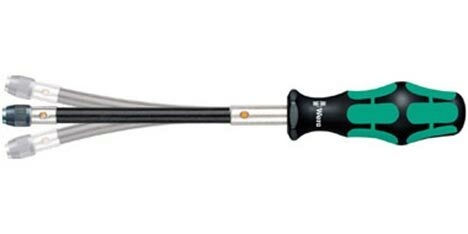 Its flexible head allows users to screw or unscrew without having a direct line of sight to the screw. It accepts all standard 1/4” bit tips, so even those specialty screws will be no match. For under $20 you can own this German engineered bit holding screwdriver complete with a lifetime warranty.